Especially for those who have never experienced it before, the sound of wheezing can be pretty scary. What, exactly, is happening when you hear that high-pitched whistling sound when you breathe? A few things. Your airway stretches from your nasal cavity to deep into your lungs. When it’s inflamed, the opening at any point of that path narrows. Think of how you narrow your mouth to whistle. The same thing is happening as air travels through your narrowed airways. There’s a long list of causes for why you may experience this inflammation—including anaphylaxis, allergic reactions, asthma attacks, COPD, and even bronchitis. Smoke, pollen, animal dander, dry air, and dust are the most common offenders, but every person reacts differently to different triggers. You may not have felt short of breath when the wheezing started, but after a few minutes it will start to feel like you can’t get enough air into your lungs. This is when an asthma or COPD sufferer’s in-depth treatment plan comes into play. Since everyone is unique, treatment should vary according to the symptoms you show and the triggers that spark those symptoms. We’ve become known for the incredibly effective treatment plans we create for our patients. Not every asthma patient will leave BreatheAmerica with an inhaler. For some patients, we find that daily medication in the form of a pill is the most effective solution. For others, it may actually be allergy medication or our shot-free immunotherapy that does the trick. Our goal is to empower our patients with knowledge to control their asthma—not to be controlled by it. 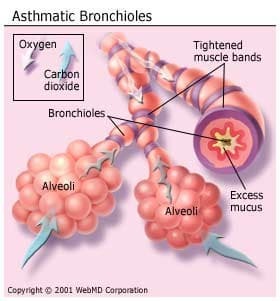 Stop wondering why you’re wheezing, and start working towards a lifelong solution with the experts at BreatheAmerica. We’re ready to change your life! Call one of our locations or schedule your appointment online today.